We don't charge anything for a quote. How long does it take to give me a quote? It normally takes about 1 - 2 hours for us to measure and plan your kitchen and give you a quote. Can you show me what my new (kitchen, bedroom & bathroom) would look like on a computer? Yes. We have the latest CAD software to show you how the design would look on a computer. Can you leave me a copy of the plan? Yes. Some other companies are not keen to leave plans, but we are so confident about the quality of our products & service, that you are very likely to purchase from us. Do you have a showroom I can come and have a look at? Yes. The showroom is in Denton, Manchester. You can view the products on display. The showroom is not staffed full time therefore an appointment must be made with us prior to arrival. For more details about the kitchen showroom please click here. 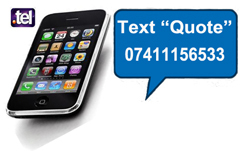 Can you give me a quote by phone? Yes. You can give us a call and give us as much detail regarding your requirements as possible. If you are happy with the quote we give you then we will need to come and visit you to double check all the measurements and show you our products before you place the order with us. Click here for our contact details. Can you give me a quote by email? If I place an order, what are your payment terms? You can find all the information about our payment terms and how to pay on this website. For more information click here to view the payment information. Do you fit kitchen worktops or do you only fit full kitchens? We can do both. If you just want your kitchen worktops changing then we are able to supply you with worktops or you can buy your own worktops and we will come and fit them for you. For more information you can visit our kitchen worktop website.